Break language barriers, simplify security challenges, streamline objective-oriented tasks, and above all ensure accuracy into your systems and services using our aerospace and defense industry translation solutions – designed to earn you true values you always wanted! The Aerospace industry is evolving every day with changing social, cultural, geographical, and security challenges worldwide. These challenges are universal in nature and are multiplied for communication differences that prevail across industries and sectors – irrespective of regions. To reduce the challenges, and ensure no linguistic issues compromise the aerospace work culture, skilled translation services step in. With a precisely-done, thoroughly-studied, rightly-structured aerospace technical translation services, the industry receives a set of integrated benefits such as reduced process-oriented errors in communication, improved technical understanding, increased geographical accuracy, besides others. Choosing an aerospace and defense industry translation services however make differences in how accurate the solutions are. A simple mistake can be costly for the entire industry. We have over a decade of professional expertise working in the translation domain for industries across countries, including defense and aerospace. We leverage on the expertise of our skilled aerospace market research consultants, translators, technical team to provide you with a range of winning translation solutions that work! We understand the crucialities of aerospace translation that involve a practical knowledge of science, complex electronics, aerodynamics using sophisticated technologies, tools, instruments and calculators. So, we know how to accurately provide the right translation solutions so that complex technical jargons and regional terms become easy understand. 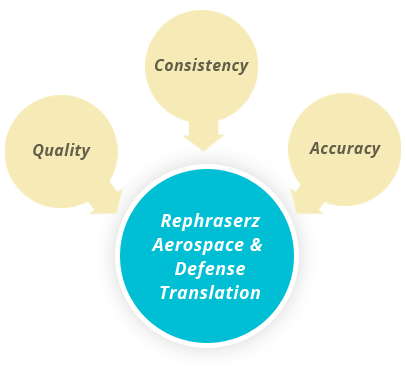 From identifying the linguistic issues arising out of defense requirements to decoding aerospace research documents and launching a thoroughly articulated aerospace market research, we do whatever is required to provide technically correct and factually understandable translation solutions. Need to contact our customer care executive for a free consultation on your aerospace and defense industry translation? Please schedule a meet now!